David was a great king. The Israelites could never forget King David. King David shaped and defined who Israelites are. He defined the country, the nation. They were proud of David. A king, a leader can have this kind of impact on a nation, on the people. They always, kind of in the back of their minds, they had King David. What King David said, and what King David did. So even their messianic expectation was Davidic. If the Messiah comes, it will come from the Line of David. So King. David was at the center of their consciousness, the consciousness of the Israelites. And as you know, David was not a perfect person. He made a mistake, a big mistake, huge mistake. He was flawed, in many ways. I’m kind of jealous of the Israelites who had this a great king, a leader. A leader is so important. So I would like to reflect on this King David today, and I’d like to reflect on your life in this country. 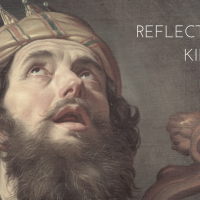 By reflecting on David, it will give us insights into our life and our own leadership. First of all, David knew how to admit his own flaws, his own mistakes. I think that’s courage, to be able to admit my own flaws and mistakes. When the Prophet Nathan confronted David and rebuked David for what he did, it was a private conversation between Nathan and King David. It was kind of like the private conversation between Comey and Trump. King David had all the power, and he could completely destroy Nathan with the power he had. He could spread false rumors about Nathan, he could do some kind of conspiracy against Nathan, or he could just simply order him to be killed, murdered. He had that kind of power, he was that kind of king. But he didn’t do that. He accepted the rebuke of Nathan and truly repented. It is hard for a powerful person to admit one’s own fault. We forget who we are when we have so much power. People that are powerful do not admit their faults because to them, that is the sign of weakness. They say only weak people admit their faults. But our greatest leader is different. St Paul, for example, he’s our greatest leader for Christians. St Paul said, “I am the sinner of sinners.” Not only that, he went further. I am the worst sinner. This great leader that we have, we Christians have admitted his own mistakes, false and flaws. Leaders who don’t know themselves are very dangerous. They will use the power accessible to them with their self-centered judgment. We should never make self-centered people as leaders because their judgment will be false. People who recognize their weaknesses can be humble. They’ll be able to understand the pain and suffering of other people. People who cannot feel other people’s suffering and pain should not be leaders. There will become monsters like Hitler. The leaders should be able to empathize with the pain and suffering of the people. People who know themselves very well can understand others deeply. People who have experienced the failures of life will understand the failures of other people. People who have suffered the sickness can understand the pain of other’s sickness. People have gone through the darkness, the deep, deep darkness of life can understand other people’s darkness when they go through that darkness. Jesus knew us very well. Hebrew writer says this, for we do not have a high priest who is unable to sympathize with our weaknesses, but we have one who in every respect has been tested as we are, yet without sin. You know, understanding other people deeply is a great skill but is a rare skill. Many people don’t understand what other people feel. A lot of people are so self-centered that they just don’t understand what other people feel. It is a rare skill, but it’s a very important and valuable skill. It shows your integrity. When you have, when you possess that skill, to understand other people’s pain, suffering, and feelings, you have an integrity of life. When we live a self-centered life. We simply cannot understand other people. That’s why Jesus said, if you want to follow me, the first thing, get rid of your self-centeredness. Get rid of self-centered thinking first, deny yourself. and then follow me. As long as you’re self-centered, you cannot follow me. Second, David knew how to wait. When David’s fame soared sky high, he could have taken kingship from Saul. He was the king when David was becoming famous, King Saul was the king. He could get rid of King Saul very easily because David was more popular. He had so much power he could get rid of Saul right there with the fame and the power he had. If he did that, he could have possessed the throne, but he would not have won the hearts of the people. He could have the position of kingship, but he cannot be the king of the people. David wanted to be the king of the hearts of the people. That’s the real king, not the king who has kingship position, the king who wins the hearts of the people. That’s the real king. He had many opportunities to kill Saul. When Saul was all by himself sleeping, David was able to enter his room. He did not kill him. He could kill him. He did not kill him, but he just left a mark that I was here. And then once he was with this group of people in the cave and King Saul came into the cave to do his business and then David could have killed him right there, but he just cut the piece of his clothes and told him I was right there, but he did not kill King Saul. He waited. Instead of creating his own future with his power, wisdom, and might, he waited for everything to work out for good. That is the wisdom. People who cannot wait are disqualified to be leaders. People who just react to the situation without waiting, saying stupid things. I wanted to say I’m not qualified to be leaders. Jesus did not do things as he liked. He always waited for the time. He often said, my hour has not come yet. It is not good to force our life. We need to learn to wait. Moses waited for 40 years in the wilderness, and he himself could not enter the promised land, but Moses, led other people to enter into the promised land. People who do not lose hope while waiting will see the fruit, ultimately. Waiting is not just passively wasting your time. We wait while working hard to prepare the soil with hope and vision. Waiting needs to prepare ourselves to receive the promise. God’s promise grows in our waiting and will bear fruit when the right time comes. In two days, we have August 15. Many of you know that is a significant day for the world and for Koreans. That is the day Korea was freed and liberated from Japanese occupation, and that is the day World War II ended. Koreans were under Japanese occupation for 36 years. Many young women were taken by force to be prostitutes for the soldiers in war. Many people were exploited, their names were erased. Their culture was erased. For 40 years. They suffered under imperialistic occupation. That was the waiting time for Koreans. That became the soil for Koreans. And I believe the God trained them for 40 years. Now the Korean Peninsula is in a great crisis by two monsters. Very harsh words were exchanged between North Korea and the US. I truly pray that there may be a peaceful resolution. I believe that 40 years of waiting was not a waste of time, for God’s great work, God has trained them. Let me say a personal thing. God will produce a great leader using that 40 years of waiting time, and a lot of you are second-generation Koreans. I believe that the leader will come out not from the Korean soil, from the immigrants. Not just people who make less money, thinkers who will come out. You have a previous history of abuse, but that abuse will never be wasted. That will turn into a passion to fight for justice and human rights. Third, David believed that our future and his future is in God’s resolution, not his. He did not try to create a future with his own power and wisdom. He trusted God and God’s resolution. That trust is in David’s bones, in every cell of his body he had that trust. I am who I am by God’s resolution, he believed. That’s what Saint Paul said. I am who I am by God’s grace. Even when he fought Goliath, he had that trust. We look at today’s passage. We can see David’s heart very well. This is what he said: “Is not my house like this with God? For he has made with me an everlasting covenant, ordered in all things and secure. Will he not cause to prosper all my help and my desire?”. He believed that everything depended on God and his decision. The reason he didn’t touch Saul and waited was that he believed that everything depended on God and his resolution. The country that is built by force will be destroyed by force. History tells us that, but the country that rules over people justly, rules in the fear of God will be like the light of morning like the Sun rising on a cloudless morning gleaming from the rain on the grassy land. Our life is the same. The life that is built by God’s resolution will never be destroyed. Did you build your life, or is your life built by your God’s resolution? When you believe that your life is built by God’s resolution, you’ll never be destroyed. You stand up again because God will never give you up. I pray that you have a sense that your life is built by God’s decision. David, as a king, had a profound impact on the future of Israel. I pray that we also have that kind of world leaders. We lack leaders. How come the evil came out of the shadow and freely told the whole world their existence, and the leader doesn’t do much about it? You don’t need that kind of leader. We need leaders who can name evil as evil. We should pray for the United States. They’re the world leaders. The most powerful nation. Their leadership is very much needed. This world needs their leadership. I hope that God may use that country to build God’s righteousness and justice and restore that. Let me recap three things that I say. First, David knew how to admit his own faults. Two, David knew how to wait. Three, David believed that his future is in God’s resolution and not his.